Okteta, a simple editor for the raw data of files, has been released in version 0.26.0. The 0.26 series mainly brings a clean-up of the public API of the provided shared libraries. 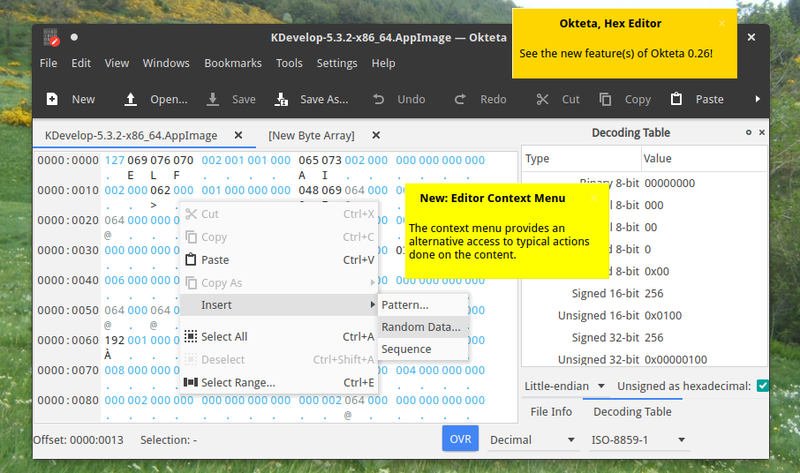 The UI & features of the Okteta program have been kept stable, next to one added new feature: there is now a context menu in the byte array viewer/editor available. Since the port to Qt5 & KF5 Okteta has not seen work on new features. Instead some rework of the internal architecture has been started, and is still on-going. Agreed. I have collected in my notes a few generic format description languages… if only there was not that other stuff on the life TODO list… At least abstracted support for data interpreters is one thing I try to include in the big rewrite.